Let’s just say I had a blast! And now I’m exhausted. It was a fun trip. 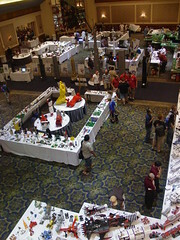 First off, let just say I’m a big fan of having all the MOCs in one area — when the themes were in different rooms at GMU, I’d sometimes miss out on a room, because I didn’t know it was down some hallway, 3rd door on the right, behind the vending machines… It was nice to compare size of structures all in the same room. I loved the location; both in a hotel & the location of the hotel. If my wife got tired, she could walk up to the room & I could continue on festing. And the hotel was close to some good restaurants & the mall. Honestly, if you’ve never been to a BrickFest before, you must take the time to go. Next story Batman Video Game?